Some handy tips we can all do in our day to day lives to help keep our home secure and safe from unwanted visitors. NEVER put your name and address on your set of keys, if you lose these when you're out, in the wrong hands you've given a potential burglar a set of keys and the adress of where to use them. DON'T leave your keys in view of a window or door, especially close to the front door, where a simple device such as a reshaped coat hanger could see your car keys literally go out the door through your letter box. DON'T leave the key that locks your door or window in the lock! A potential burglar could break a window and let themselves in to your home. If you don't know the person at the door, don't give them the opportunity to come into your home. A door chain or peep hole are great ways to see who is there without opening the door fully. DON'T leave a ladder in your garden unlocked, this can be used by the potential burglar to reach a higher window on the first floor to gain access. 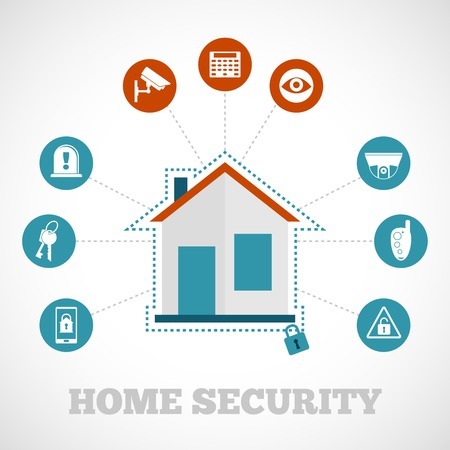 Here's some additional security ideas to help increase your homes resistance to breakins and burglars at relatively little cost. Make sure all your downstairs windows have locks fitted and keep them locked, with the key in a safe place (not in the lock). Also make sure any easily accesible first floor windows have locks, those above flat roofs for example. Make sure your properties outbuildings and sheds have quality padlocks i or lcoks to protect your valuable equipment you have stored in them. There are extra things you can do to help with your homes security alongside making sure your have adequate locks securing your home. Windows that have venetian or vertial blinds fitted can be a deterrent, due to the noise they would make if a potential burglar was to try and gain access through a window with them fitted. Motion detection lights on your property will illuminate any potential unwanted guest late at night, making them think twice. Driveways with gravel or stone can make a noise underfoot as they approach your property and be a deterrent. Dummy camera systems, these look like real CCTV cameras, giving the potential burglar the idea he is being watched and filmed. Security systems, these can record the exterior and interior of your property day and night, some systems can also alert you of any movement via an email to your mobile device. Get a safe and place your valuables in the safe when your don't need them or you're out. Don't forget to also check out our guide on how to keep your home safe whilst you're on holiday. We hope this guide has been helpful and always keep yourself safe and if you are adding any extra security measures, ALWAYS get a reputable locksmith to do the work.